You're spoiled for choices if you're craving barbecue in the Jonggak/Jongno 2ga area as it has just about every major Korean barbecue chain in it. 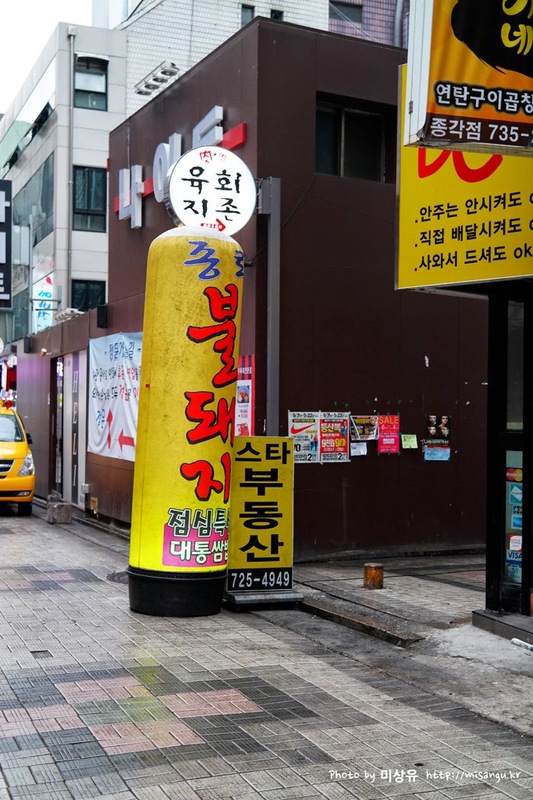 One day, when a few of us were in the area and craving some barbecue, we were sifting through our plethora of barbecue choices when I came across a place called Jongno Bool Dweji. It seemed to have been hit up frequently so we took it as a good sign and decided to make a drop by the spot. Though it took a bit of work to find, we found the place relatively packed for a Sunday night and teeming with chatter and activity. The place is already quite famed, having appeared on a number of television show segments. Its owner seems to have some sort of close relations with the Korean entertainment industry as the walls show pictures of the owner posing with Korean celebrities such as Super Junior members, famous comedians, etc. One of the biggest appeal about Jongno Bool Dweji is the fact its serving size to price ratio is a sweet deal. In fact, any single serving of its five main dishes goes for 12,000 won with a sole serving size for the garlic ogyeobsal (garlic pork belly) is 200 grams and the soy sauce pork (간돼지), the spicy pork (불돼지), spicy chicken feet (불닭발), and eel (꼼장어) is 250 grams per serving. These are excellent prices considering most barbecue restaurants lately charge about 14~15,000 won for samgyeobsal with serving sizes being about 150~180 grams. At Jongno Bool Dweji, their garlic pork belly, soy sauce pork and, the spicy pork draw the biggest buzz. The other dishes offered include the spicy ramen and the bibimbap (both priced at 3,000) while a bowl of rice will set you back 1,000. Carbonated drinks are 2,000 and all other alcohol- from soju to beer to makgeolli- are 4,000 a bottle- definitely great prices for a barbecue restaurant in the busy Jongno area. We made it a mission to try out all the pork dishes on this visit and began by placing a 2 serving order of the garlic ogyeobsal. A burner and grill was brought out and the usual side fixings including slivered garlic, pepper, sesame oil and salt, ssamjang, kimchi, pickled radish slices and a chives salad. The ssam had a mix of different greens rather than the usual sangchu only which I appreciated although the greens were rather few for our group of four so we had to request refills quite often. Jongno Bool Dweji is unique from other barbecue joints in that it provides a bowl of mussel stew (홍합탕) for free for each table with orders. I'm not a big mussel soup fan in general, but it was perfectly fine- though, I would have preferred a more common bowl of dwenjang jjigae more. The pan for the ogyeobsal comes with a bit of kimchi, spicy soybean sprouts, potato slice, tofu slices, mushroom slices, and shrimp on one side. The pan is heated up before the ogyeobsal are laid out across. One of the draws of this barbecue joint is that the meat comes mostly or fully cooked, so you don't walk out blatantly advertising to everyone near you what you just ate through the smell on ya. The garlic ogyeopsal comes about 80 percent cooked with some nice scorch marks from its pre-grilling. Little bits of minced garlic are clearly visible on the meat and provides a lovely smell as the meat cooks. The ogyeopsal comes in a nice 1/4"-ish thickness which gives just enough chew but not just a chunk of meat. Its taste was fairly good- you could certainly tell it wasn't low quality meat while the bits of garlic gave a nice touch to the meat taste on its own. Nevertheless, it wasn't anything I found exceptional on its own but I enjoyed it still in wraps. The bool dweji (spicy pork) was the memorable dish of the night. The spicy marinated pork comes fully cooked from the back kitchen over a charcoal flame and it immediately enticed with its gorgeous red hue and char marks. Slightly sweet, a bit smoky but largely fiery, the taste packs a wallop on its own and develops an addicting quality. Unlike the pork belly, there's hardly any fat on this meat but it still remained moist and flavorful and far outshone the garlic samgyeopsal. I suppose if your restaurant is named after this dish, it certainly should be the most impressive. For those who are less keen on the fire, the kan dweji (soy sauce marinated pork) is a safe choice. It's the same cut of pork as the spicy pork except marinated in a sweet and savory marinade that's mostly soy sauce based. It, too, comes pre-cooked on an open flame in the back to provide the charcoal touch to the meat flavors. I still preferred the spicy pork over the soy sauce pork though. Walking out of our meal, my friends and I each differed on whether Jongno Bool Dweji was an exceptional barbecue restaurant but we all agreed it was a perfectly fine establishment. I had a nagging feeling for a few days afterwards that I had eaten something similar tasting with a similar vibe somewhere before when it finally hit me- the currently trendy slew of "glamping" barbecue restaurants around Korea. The various camping themed barbecue restaurants that are so popular right now all offer similar menu items such as pre-cooked samgyeopsal, pre-flame grilled marinated meats, and fixings. If you added a few tents and cliche camping utensils at Jongno Bool Dweji, the place could easily pass as another glamping joint. But thankfully it hasn't fallen into that gimmicky concept and the prices at Jongno Bool Dweji are far superior to any glamping restaurant I've seen. In fact, you're still getting the nice, smoky and charred flavors from Jongno Bool Dweji's flame grills without having to pay premium for a humdrum barbecue-themed restaurant. Jongno Bool Dweji is a perfectly fine barbecue joint that brings the open flame taste of a real barbecue with less hassle and smell and without making you pay more than you need to. Taste-wise everything is fine here, though nothing exceptional. Jongno Bool Dweji's real draw though, lies in its low prices that doesn't skimp on serving size either. The restaurant is visible on the first floor of the big office building you'll see in that alley. 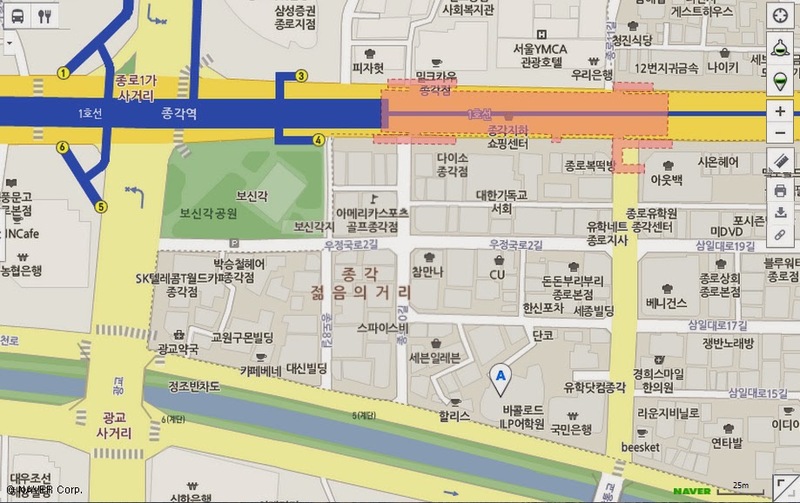 Jongno Bool Dweji does not take reservations in its peak dinner hours between 6-9PM on any night. They also do not allow a member of a group to come and claim a table to wait for the rest of the group. Jongno Bool Dweji has another branch in Deungchondong, near Deungchon Station, exit 7.